Plays rock or heavy metal. Pre-recorded riffs from live instruments including electric guitar, electric bass, keyboard and drums. Batteries included…. 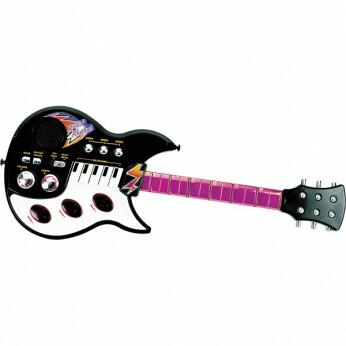 This toy costs approximately £16.99 (for the latest and best prices make sure you check our retailer list for the Rockin’ Rhythms Electronic Guitar above). In our review of Rockin’ Rhythms Electronic Guitar we classed it as being suitable for ages 3 years, 4 years, 5 years but recommend you check the manufacturer specific advice before purchasing.